How to Convert MP4 to AAC for Free? 3 Solutions! Want to extract background music from MP4? Converting MP4 to AAC is a good choice. But is it possible to convert video to audio as they are 2 total different file format? Well, the answer is ABSOLUTELY. Interesting? The following part is going to show you the process of MP4 to AAC conversion. Let's see! You can convert MP4 to AAC using iSkysoft Video Converter Ultimate. It is considered as the fastest converter on the market. It can help you easily convert MP4 to AAC, MP3, WAV or other video formats. Convert over 150 video or audio format; MP4 to AAC conversion is one of them. Stable & Efficient Conversions of Videos with new Algorithm & GPU Acceleration Technology. Video Trim, Playback, Crop or rotate, Add Special effects etc. for best video quality. Burn any video to DVD or copy DVD file as a backup. Download online videos from over 1,000 popular sites, including Facebook, YouTube, Vimeo, VEVO, etc. 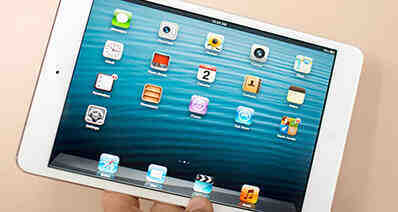 Video converted to iDevice format such as iPhone, iPad, iPod & Apple TV are automatically synced with iTunes. Compatible with Windows 10/8/7/XP/Vista, macOS 10.7 Lion to 10.14 Mojave. You will have two options to add MP4 files to this iSkysoft MP4 to AAC converter. It will be either dragging and dropping, or clicking “Add Files” from the main menu. You will have the privilege of adding more than one file at the same time because batch conversion is supported. The format tray at the bottom of the program has many output formats to choose the best one from. Now make sure to choose "AAC" format under "Audio" category. 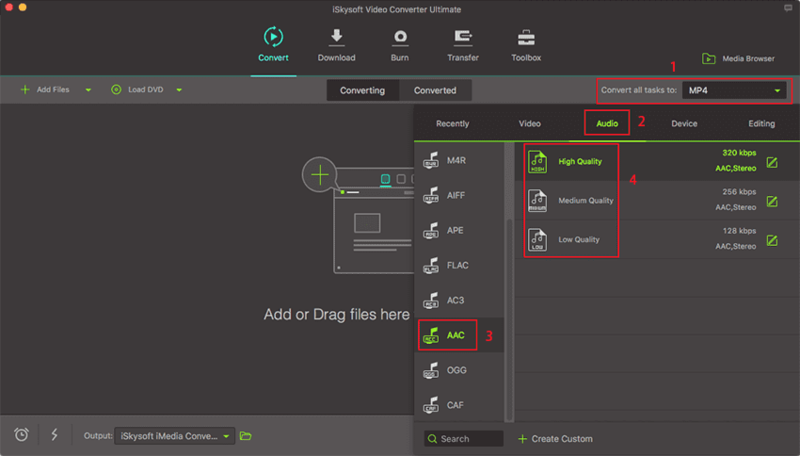 To convert your MP4 files to AAC, click the “Convert” button. That should get accomplished soonest possible because convertors work at very high speeds. If you want to customize your output settings, do that as per your wish. Here are two useful free options for converting MP4 file to AAC without incurring any additional cost. 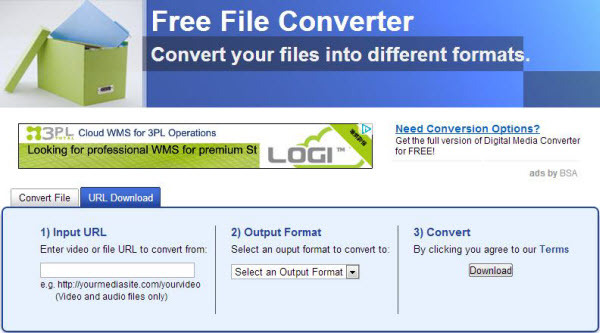 Your search for a free MP4 to AAC converter ends with FreeFileConvert – a reliable medium of deriving out the desired output in a swiftly manner. After conversion, one needn’t to worry for the quality affecting a bit as freefileconvert renders utmost quality assurance to its users. It converts several combinations of audio, video, archive, document file types easily. This mp4 to acc converter can take inputs from Google Drive or Dropbox and process conversion of desired format! 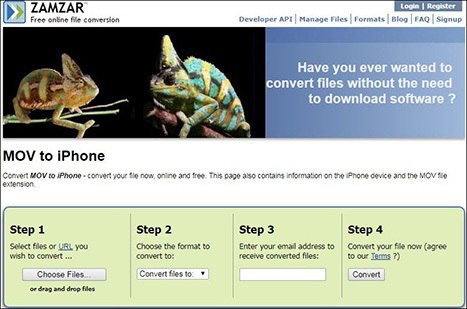 The other useful converter is Zamzar – essential in converting a couple of file formats easily. This MP4 to AAC can cater in converting popular file formats without affecting an inch on the quality of the file! Besides converting files, Zamzar also ensures to shield the files with firm encryption method when one downloads or uploads the file in the program. The best part about this converter is that it can support conversion of up to 2GB of file space.